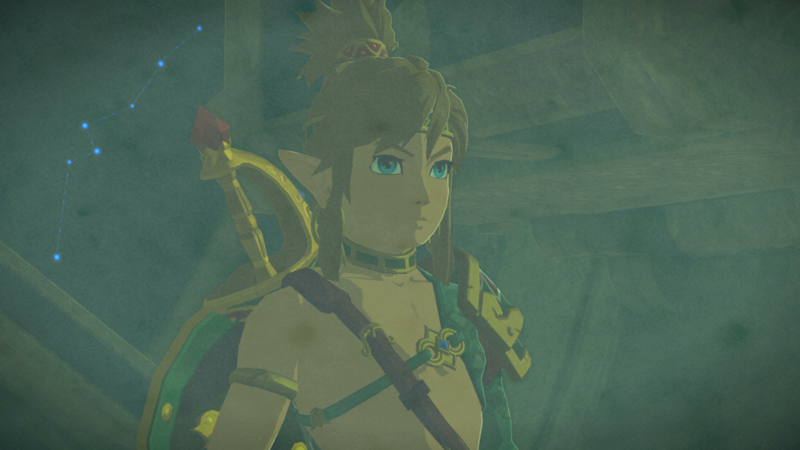 In The Legend of Zelda: Breath of the Wild's new DLC, Champion's Ballad, players have been given access to four new DLC story quests. 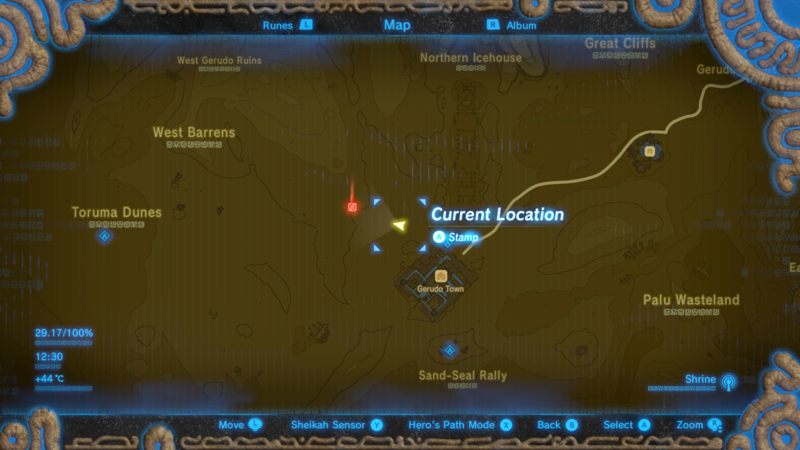 One of these quests takes place in the sandy plain of near Gerudo Town, called EX Champion Urbosa's Song. 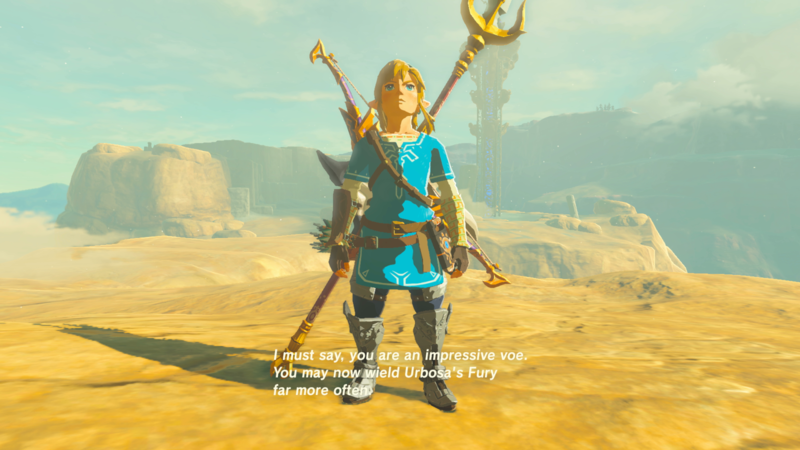 You will be able to learn more about the Gerudo Champion Urbosa upon completing the quest. 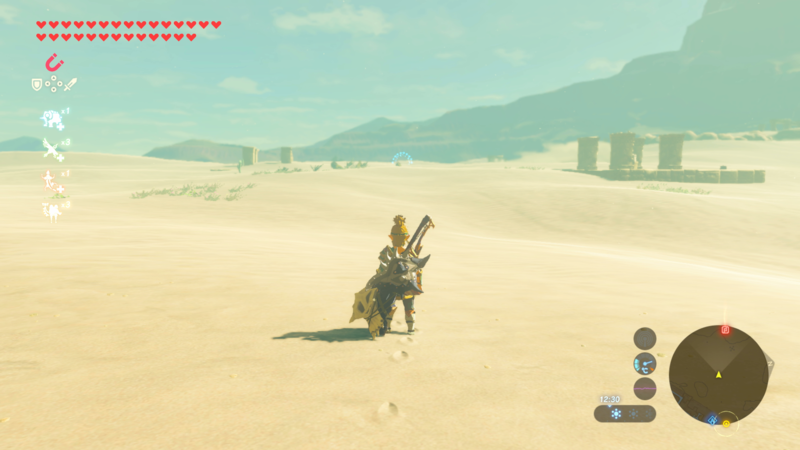 To begin the quest, head southeast from the Divine Beast nearest Gerudo Town. 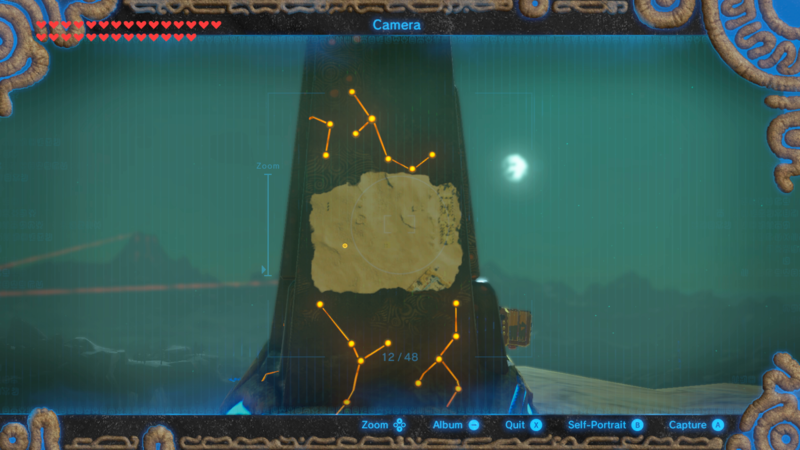 You''ll find the Arisen Pedestal on a cliff near some relic Guardians. 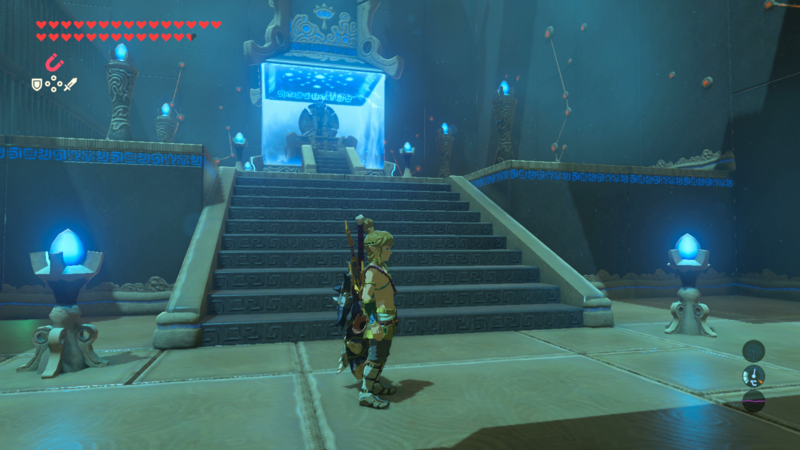 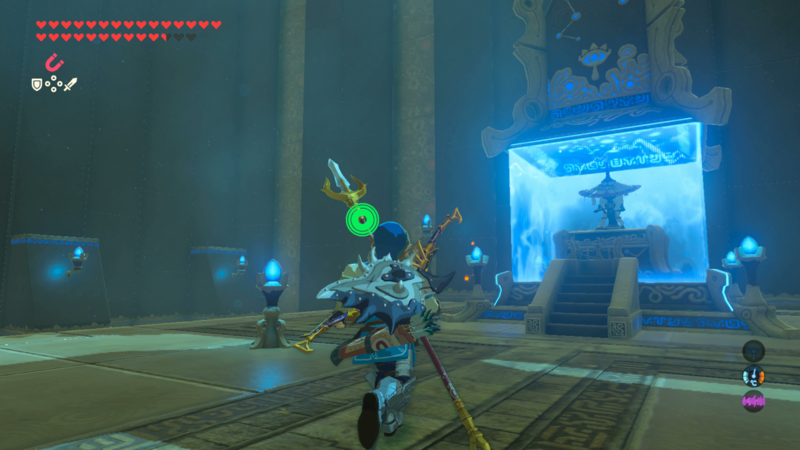 Once you walk up to the Pedestal, a cut scene will play revealing the location of three trials that you will need to complete to find Urbosa's Trials. 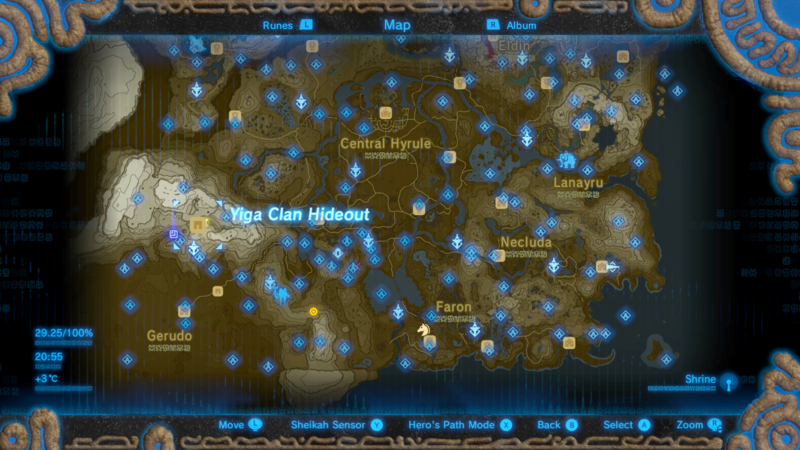 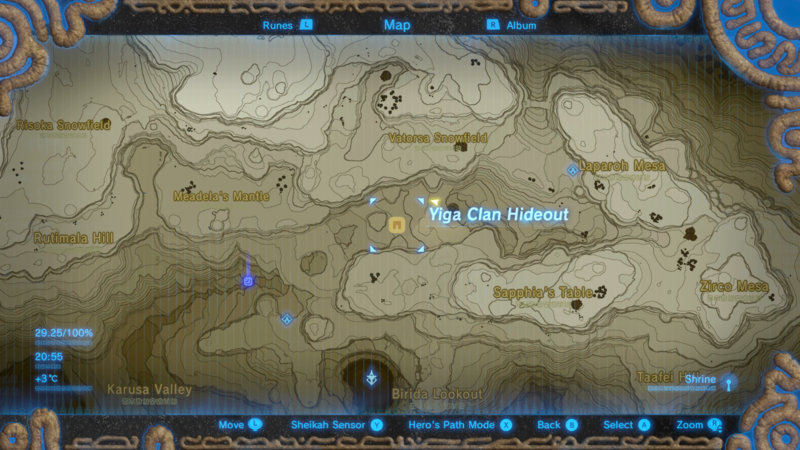 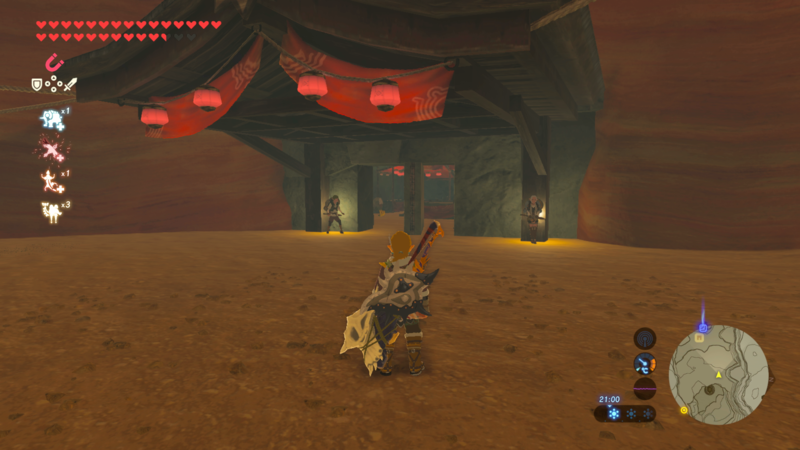 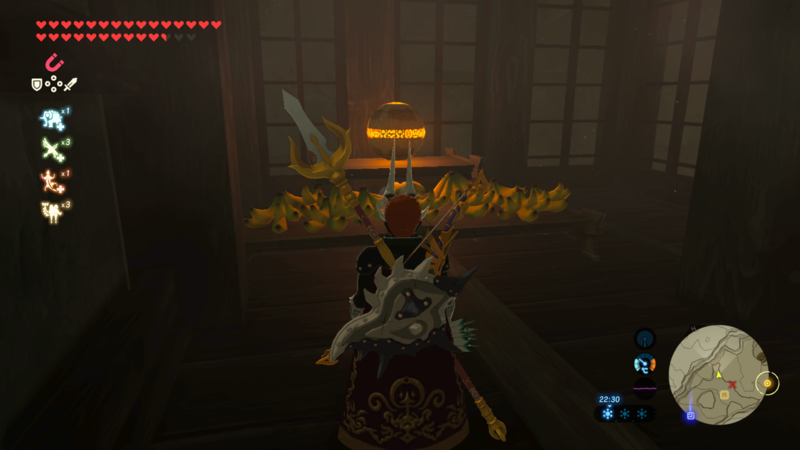 The exit to the Yiga Clan hideout, which was once closed, now re-opens in the Champion's Ballad DLC. 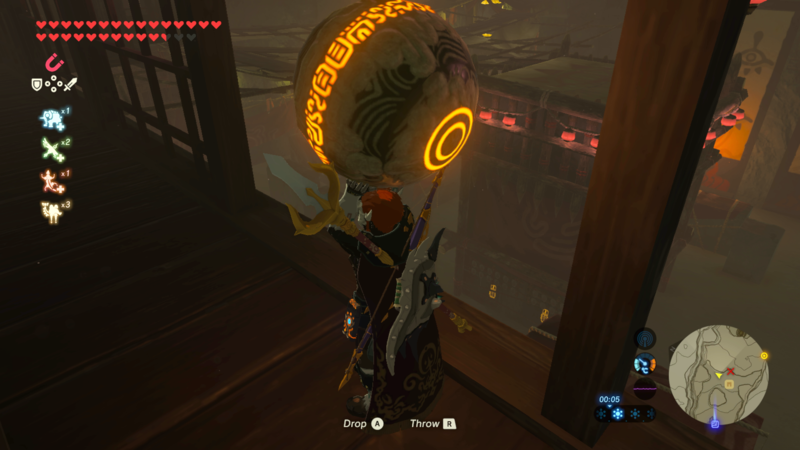 You will need to navigate through it to find a glowing sphere hidden in the rafters above and then bring it out of the hideout without being caught. 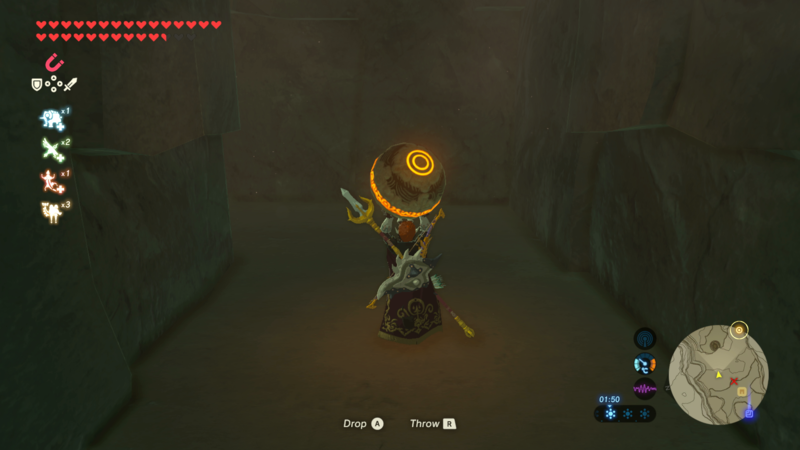 If you are caught, the sphere and your position gets reset, meaning you will have to redo everything all over again. 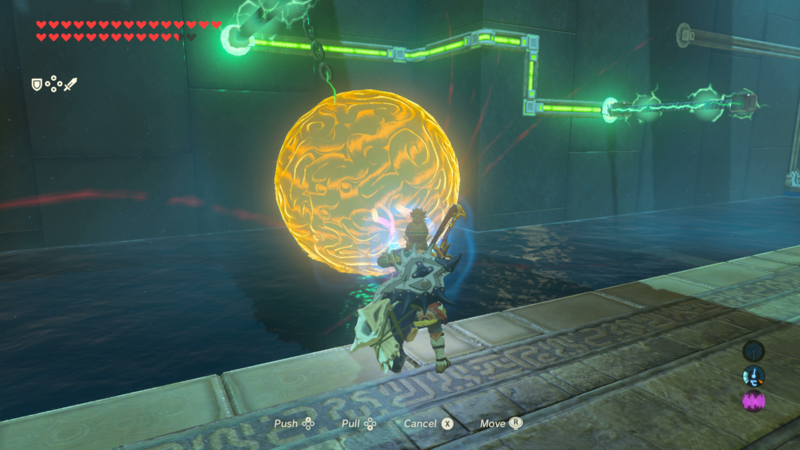 Once you have the sphere, you will need to throw it into the circular pit just outside of the exit you entered to spawn the Shrine. 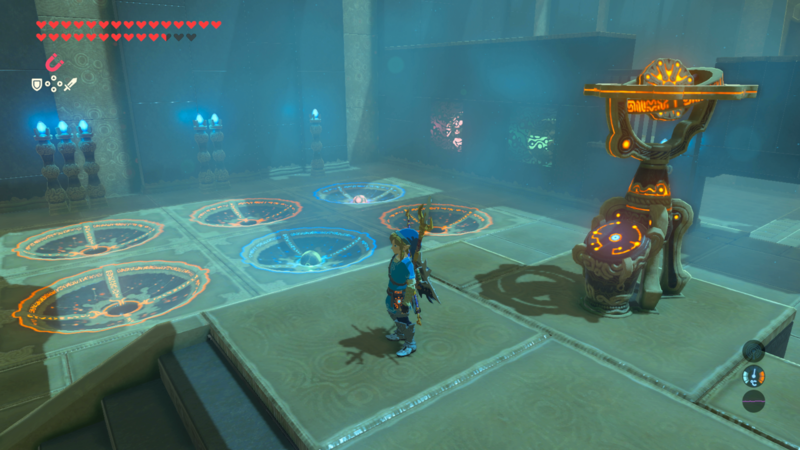 You will need to deduce how many colored balls are in a box in order to pass this trial. 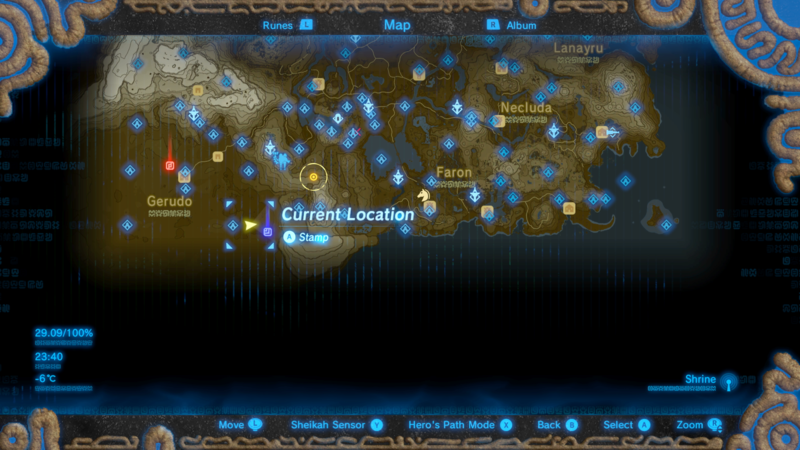 It is pretty straight forward, with each color and number being represented in a grid on the ground. 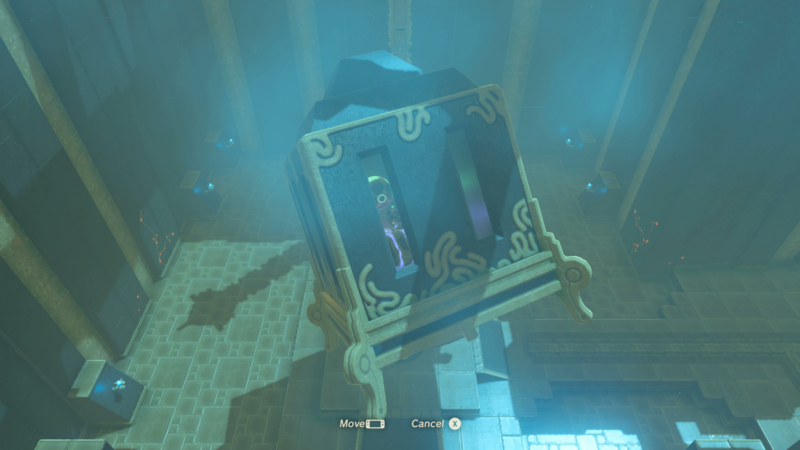 The number of spheres in the box is as follows: Pink is one, green is two, yellow is two, blue is four. 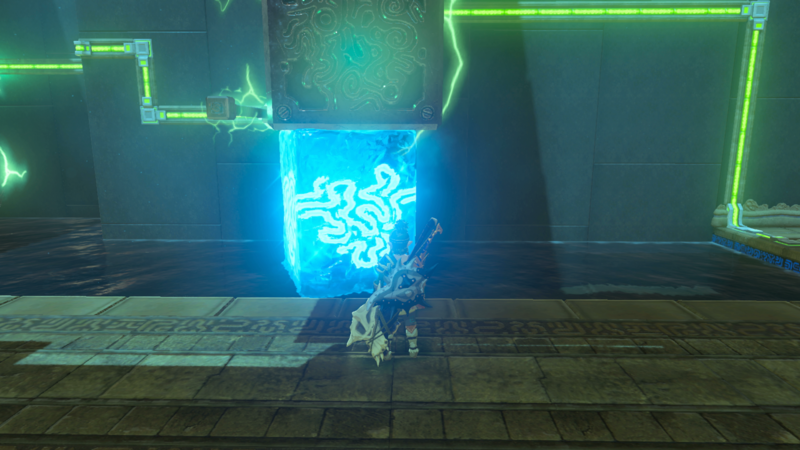 Once you place the correct colored spheres into the mechanisms, the gate will open, finishing the shrine. 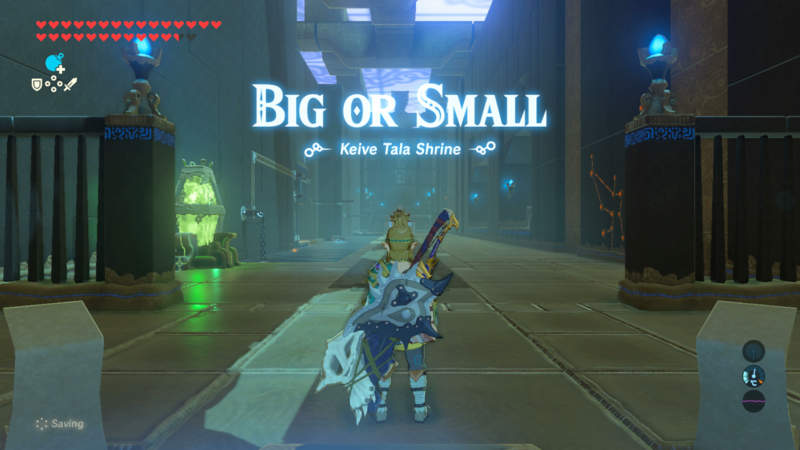 You'll need to beat a powerful mini boss in order to spawn this Shrine, so be sure to stock up on powerful weapons for the fight ahead. 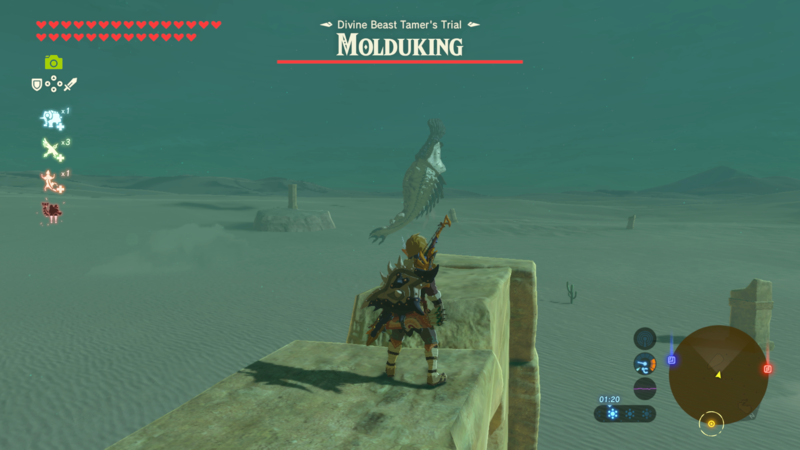 To be the Molduking, perch yourself up on one of the nearby relics and wait for Molduking to approach. 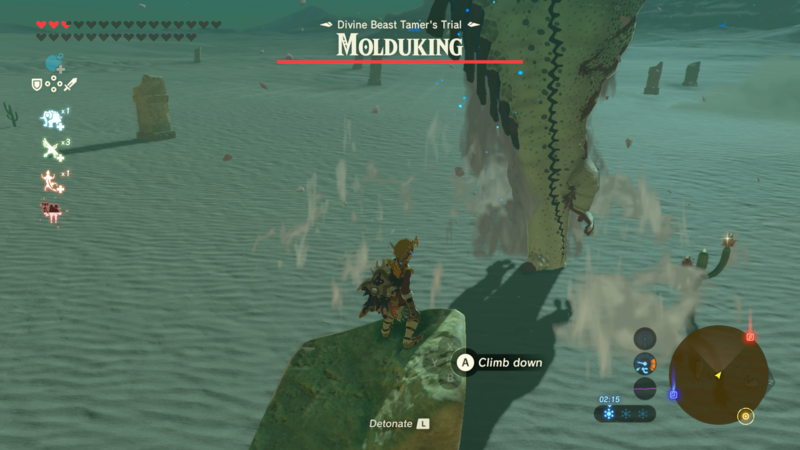 Throw the bomb into the sand below and the Molduking will instantly eat it. 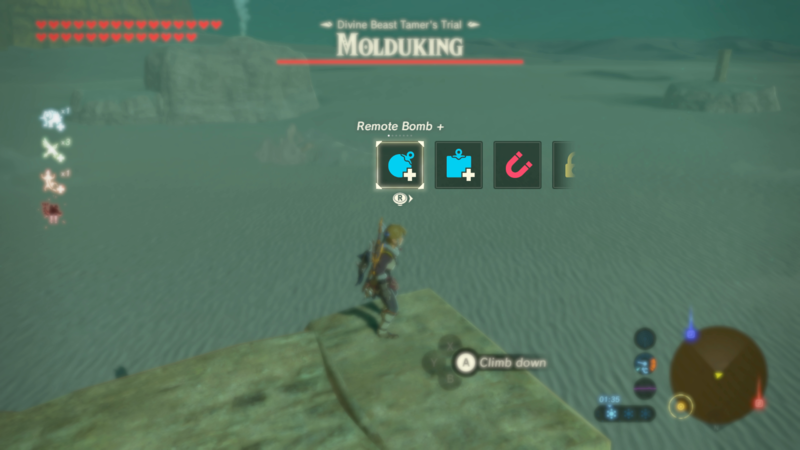 Blow up the bomb and jump down to hack at the Molduking for a few seconds, then head back on top of the relic for safety. 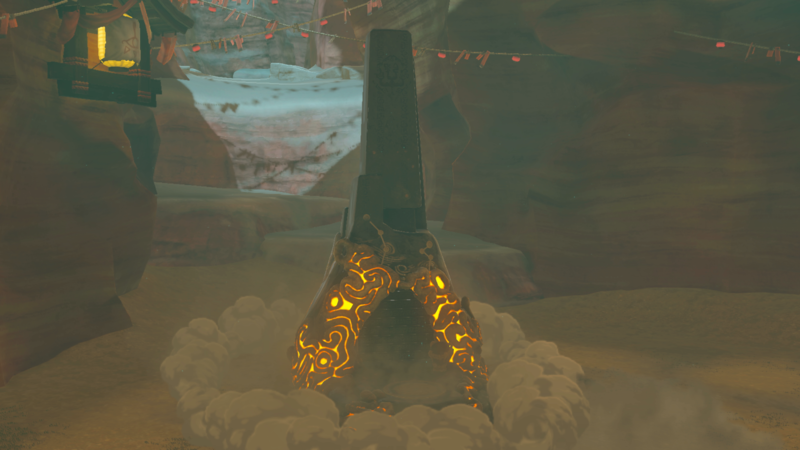 Rinse and repeat and the Molduking will be defeated in no time. 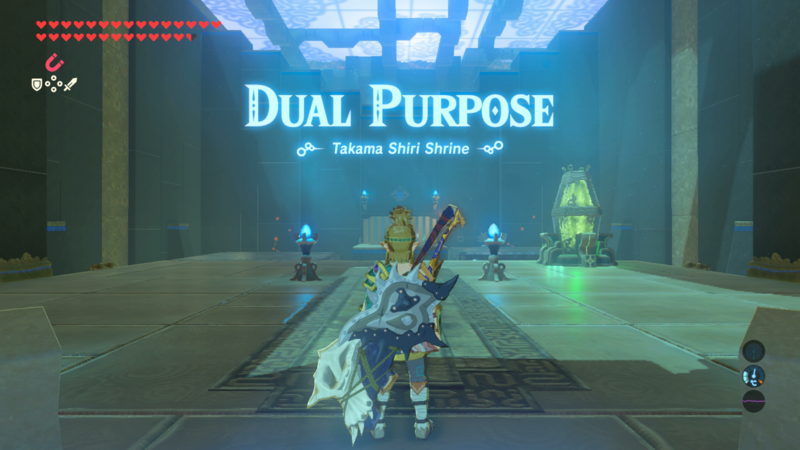 This shrine is pretty straight forward. 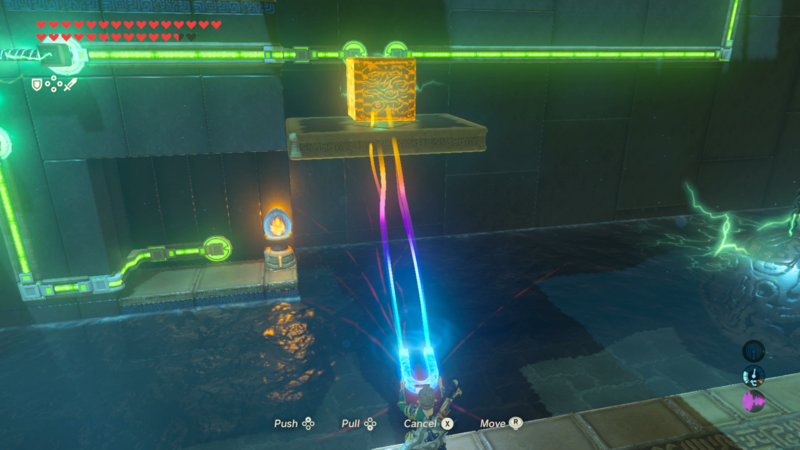 The you need to connect the electric circuit from the start of the shrine to the end using a series of metal blocks and structures to keep the circuit from breaking. 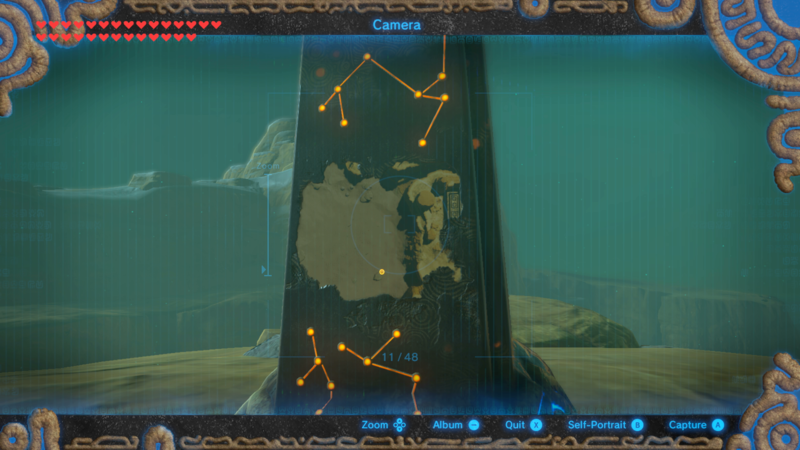 Use the pictures above to see the order and items needed to complete the Shrine's puzzle. 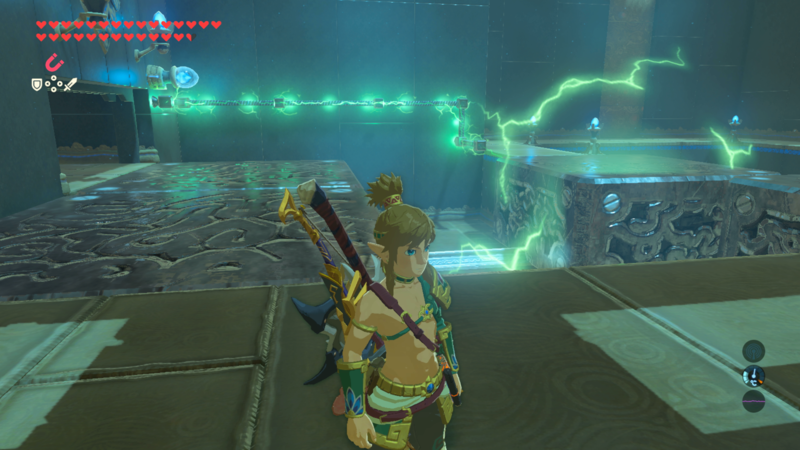 Be careful, however, that electric can hurt Link if you get too close. 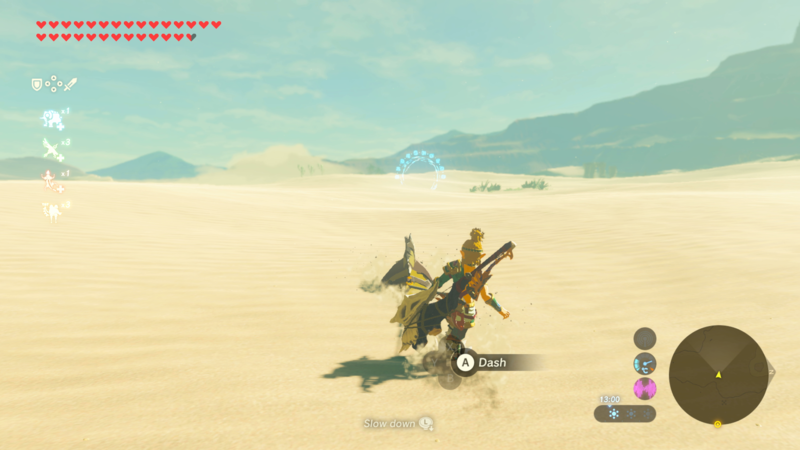 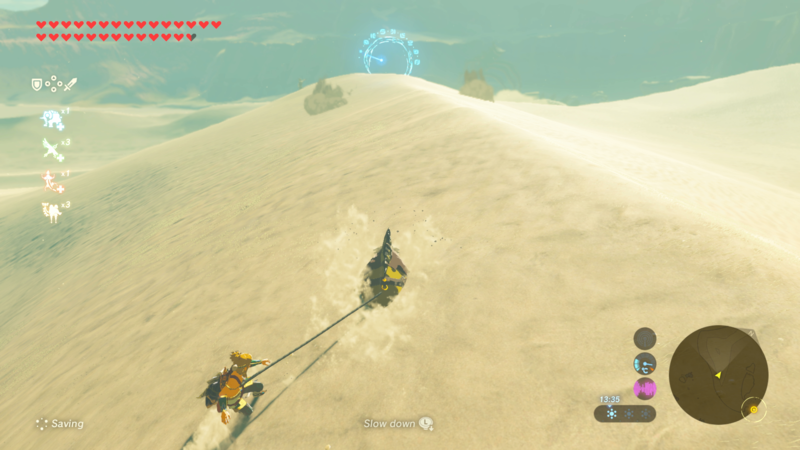 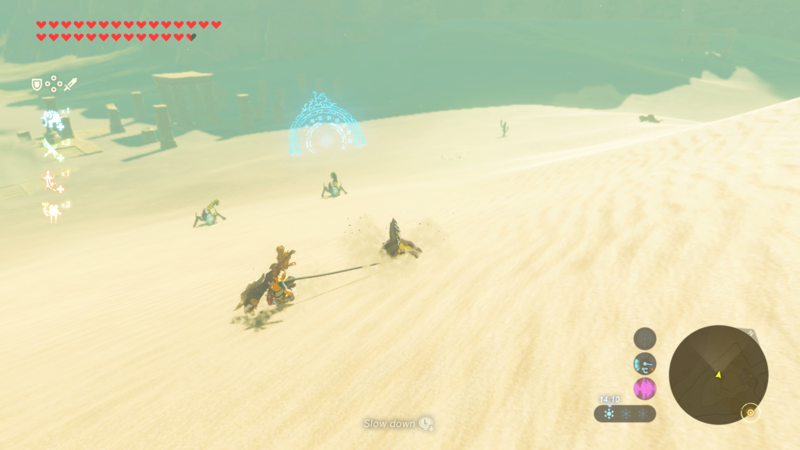 If you head northwest of Gerudo Town, they will become across a lone Gerudo with a bunch of Sand Seals that you will be able to grab and use to traverse the desert. 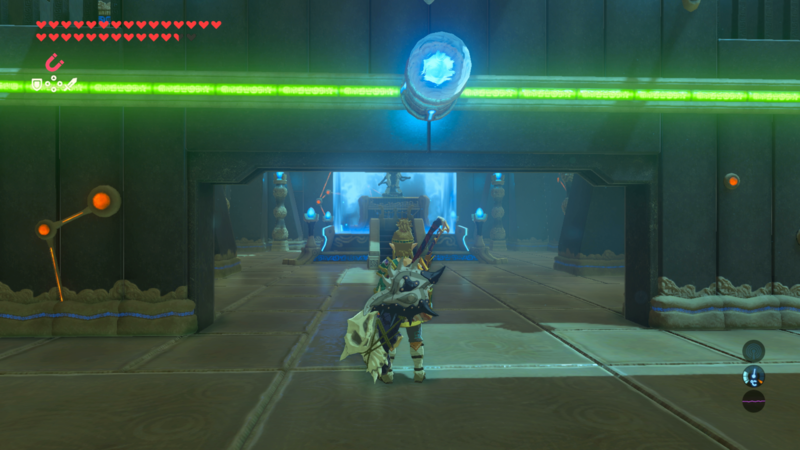 Right next to these Sand Seals is a blue ring that you need to go through to start an obstacle course. 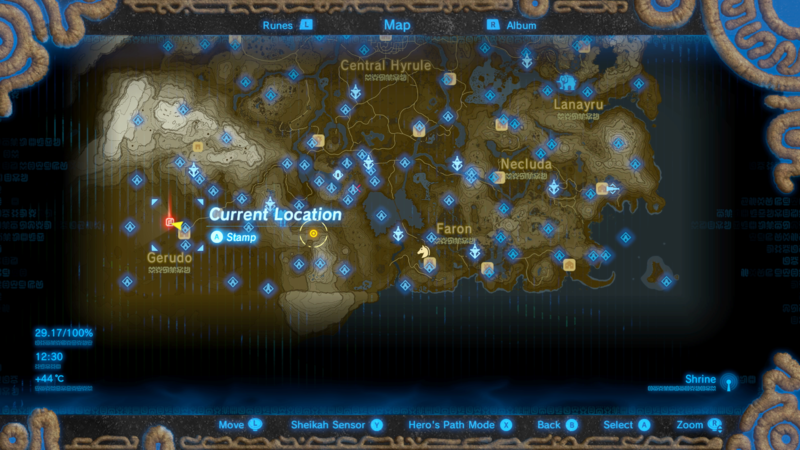 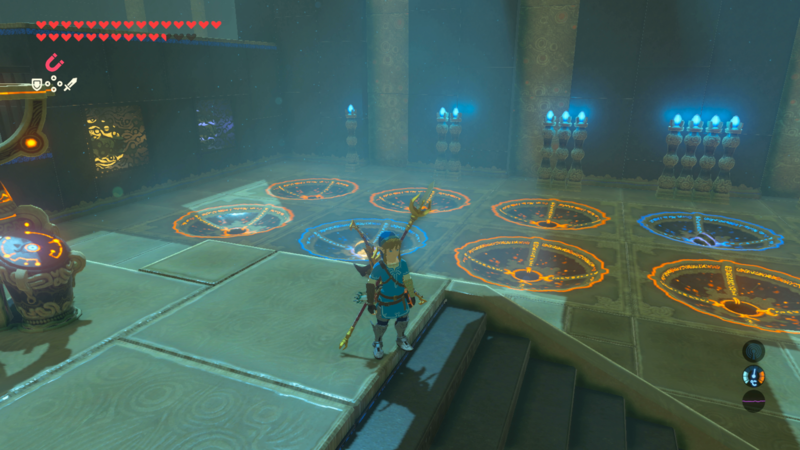 Go through each blue ring that spawns until you reach the end, using the Sand Seal to get through quick enough to unlock the Shrine. 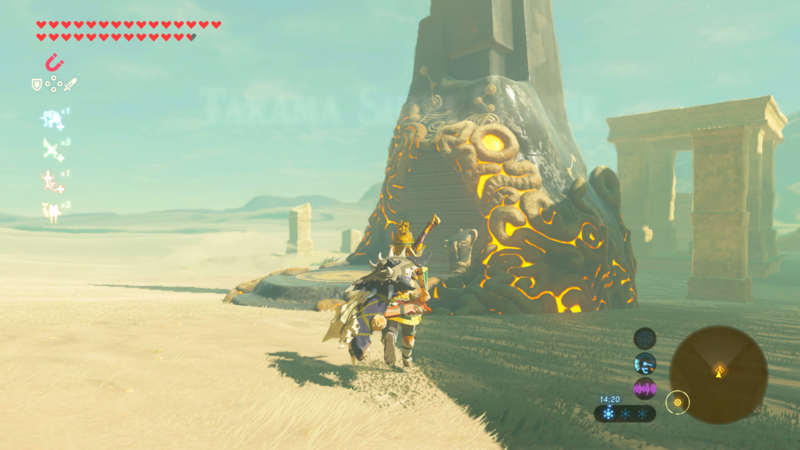 The last Shrine is a bit tricky. 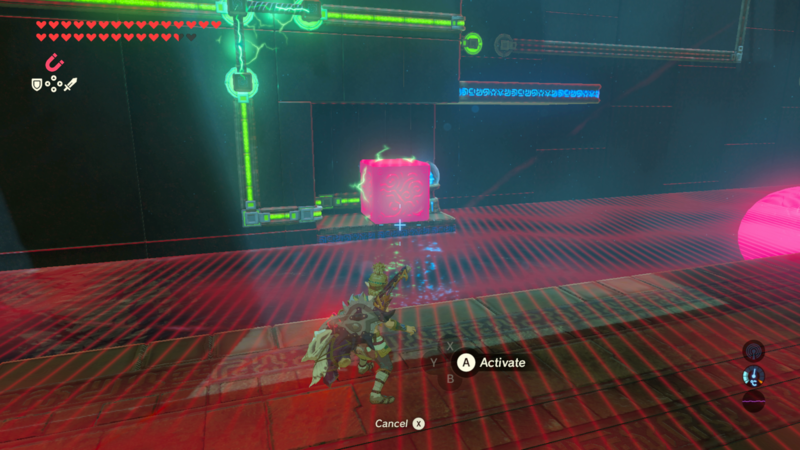 You will need to move large metal structures using their Magnesis ability to get over obstacles, all while avoiding the electric current. 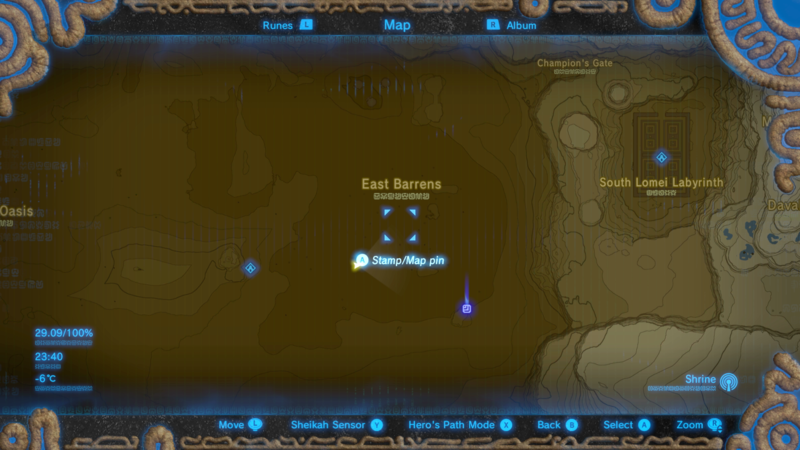 The first section is straightforward. 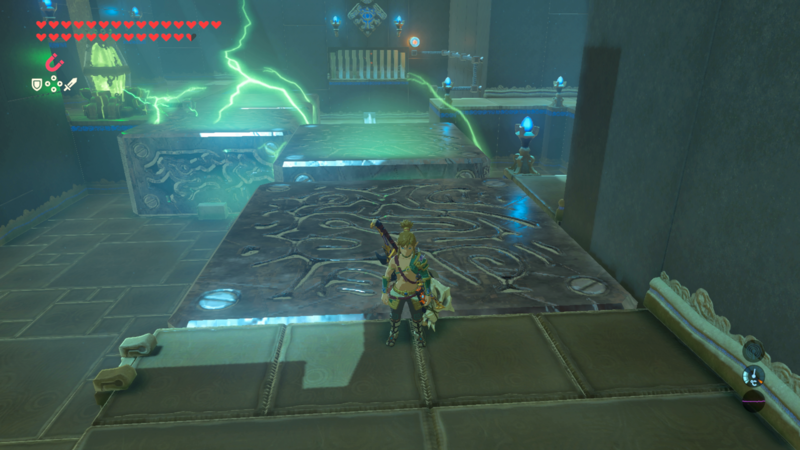 Make a bridge out of the metal structures to get over to the other side and then move the metal structures to create an electric current to open the door. 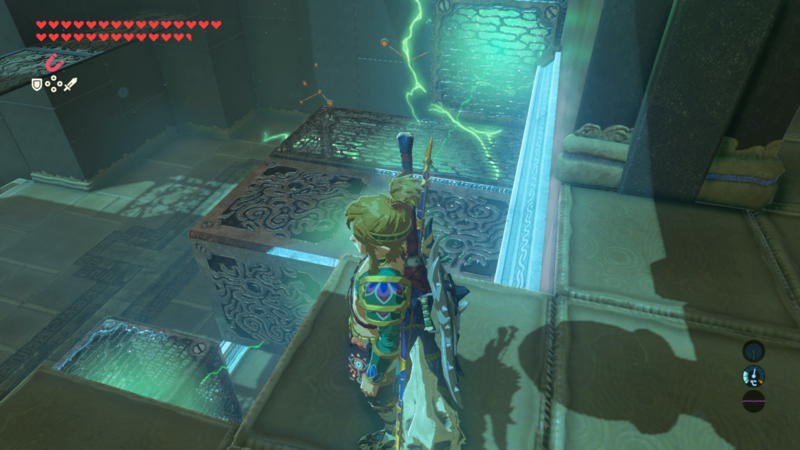 Similar to the last section, you will need to maneuver the metal structures away from the electricity until they get to a safe point near the door. 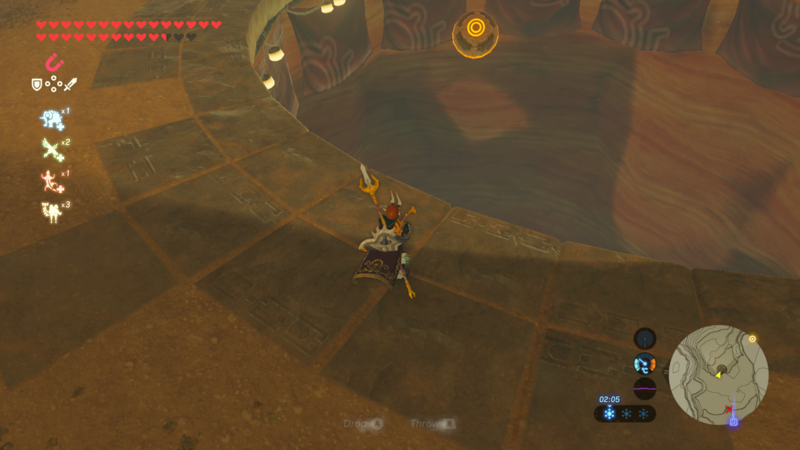 You will then need to split the metal into two parts. 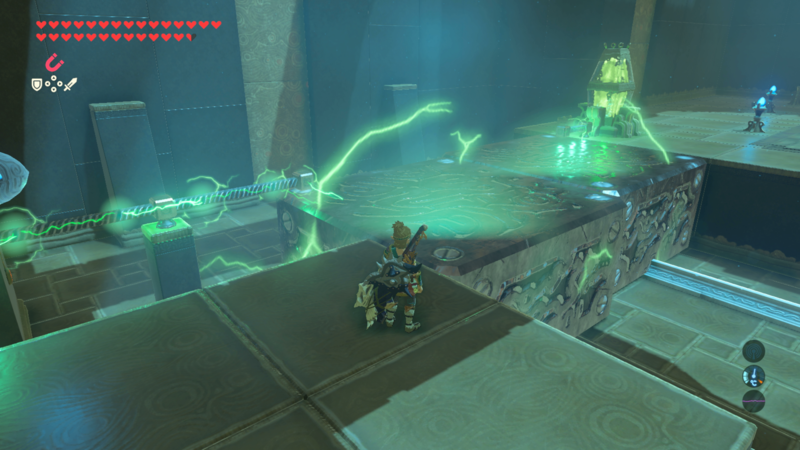 Two metal parts need to make a bridge to get the player to the exit while the other sections create an electric current to open the bridge. 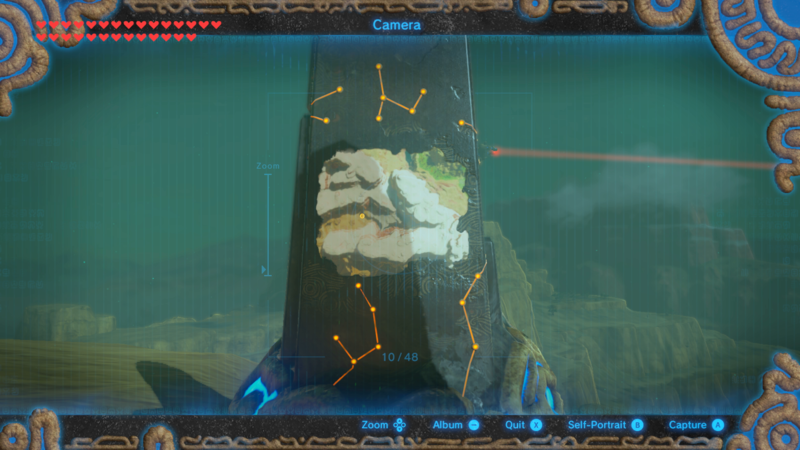 Use the pictures above to help. 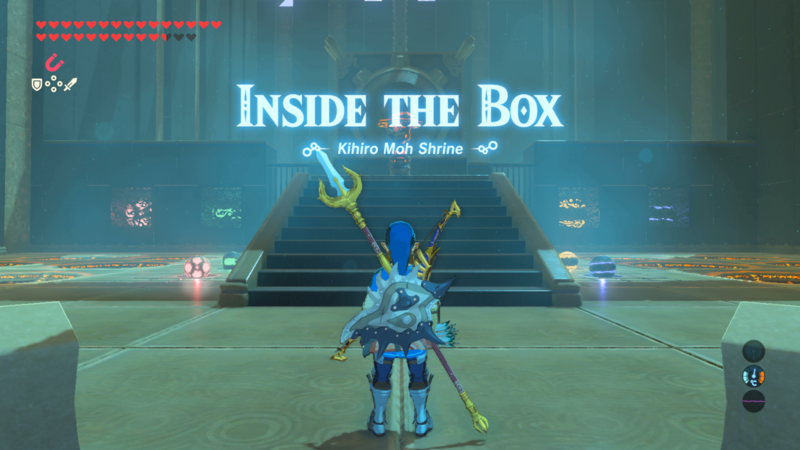 The last part is a bit tricky. 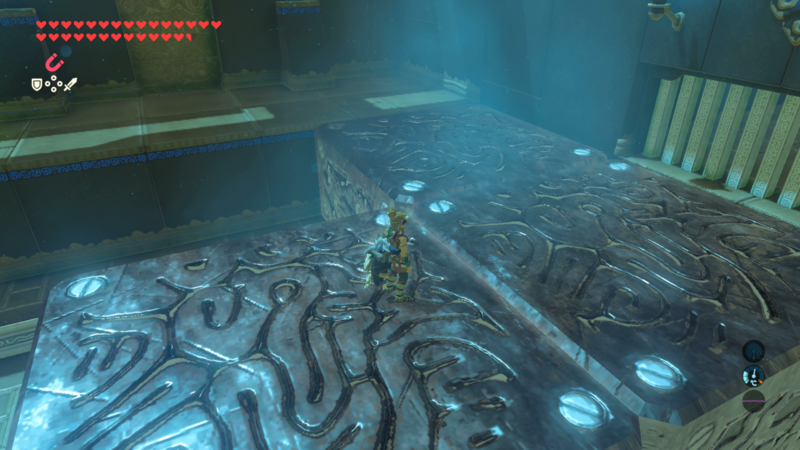 First, you should move the metallic stairs in such a way that allows them to climb up to the exit. 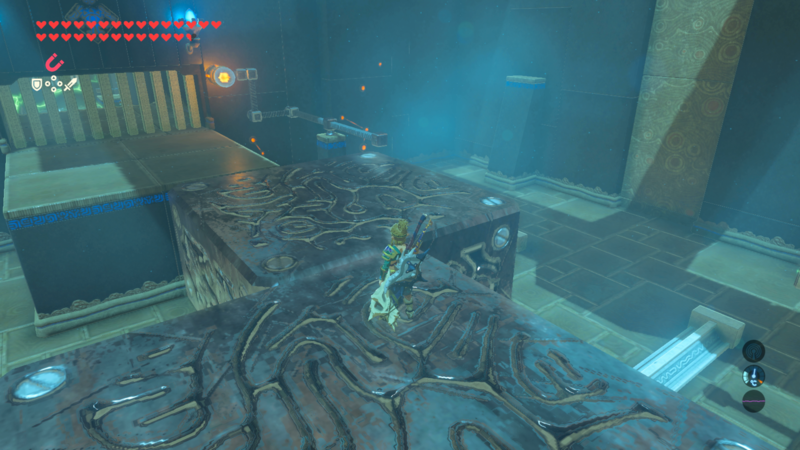 Then, you will need to restructure the stairs carefully while overlooking them to create an electric current from one end of the room to the other without falling off. 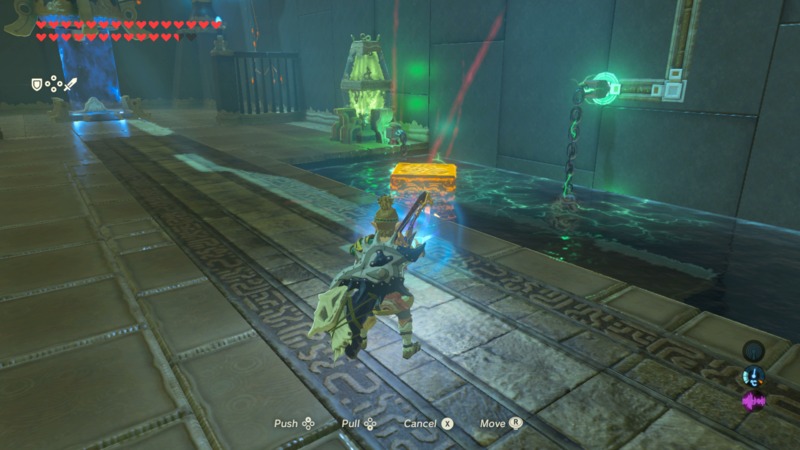 Doing this will unlock the exit to the Shrine. 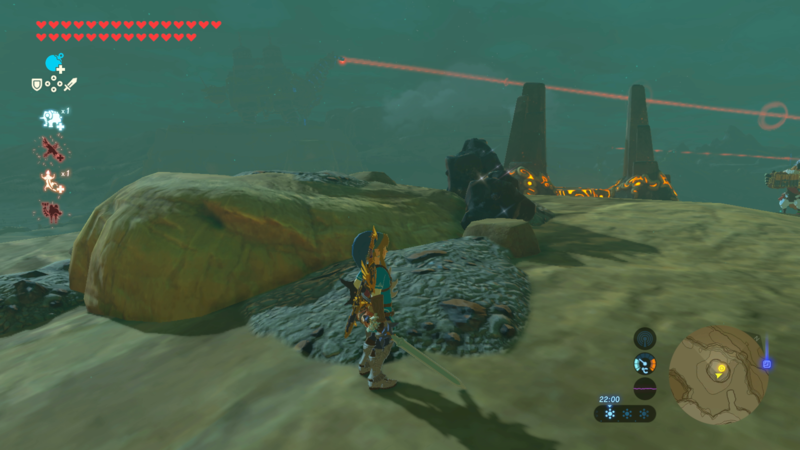 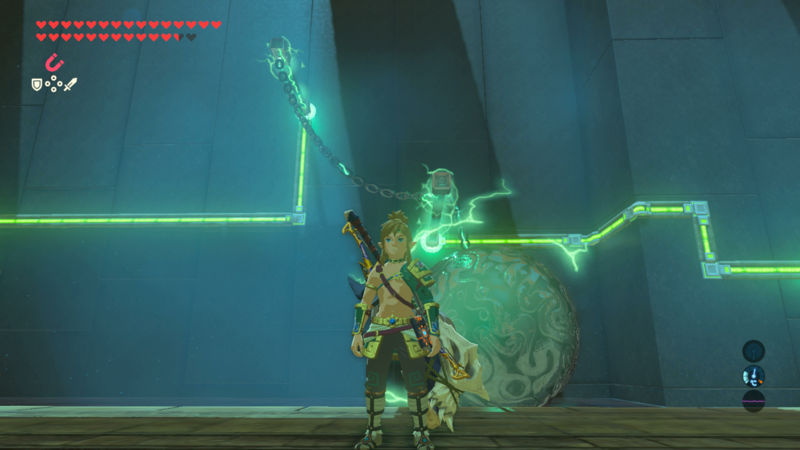 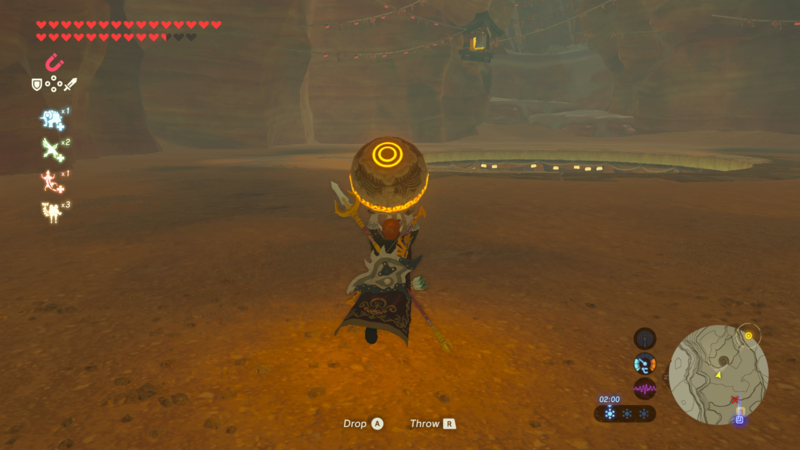 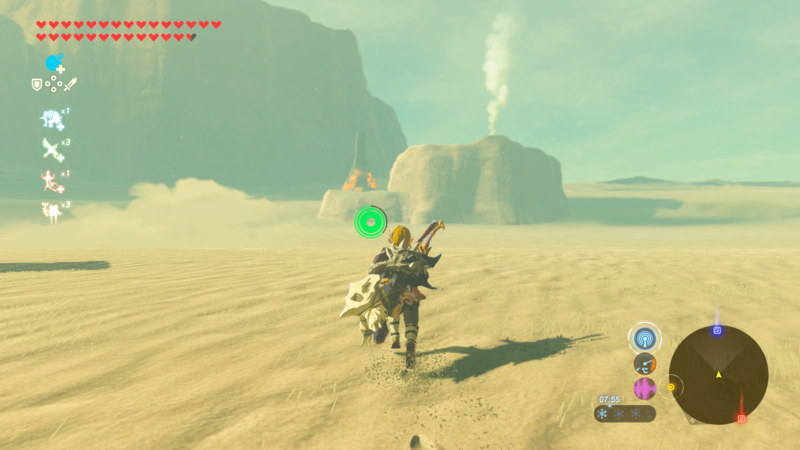 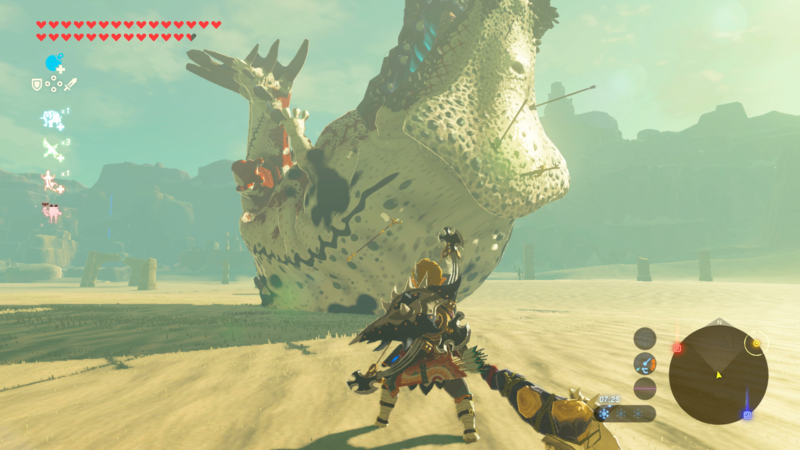 After beating all of the trials, you need to return the Divine Beast beside Gerudo Town. 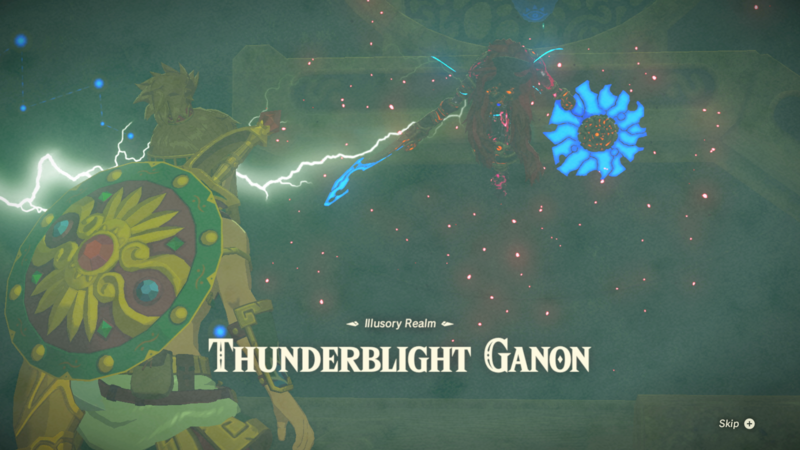 When they do, they will be greeted by a cut scene before being thrown into a boss battle against Thunderblight Ganon. 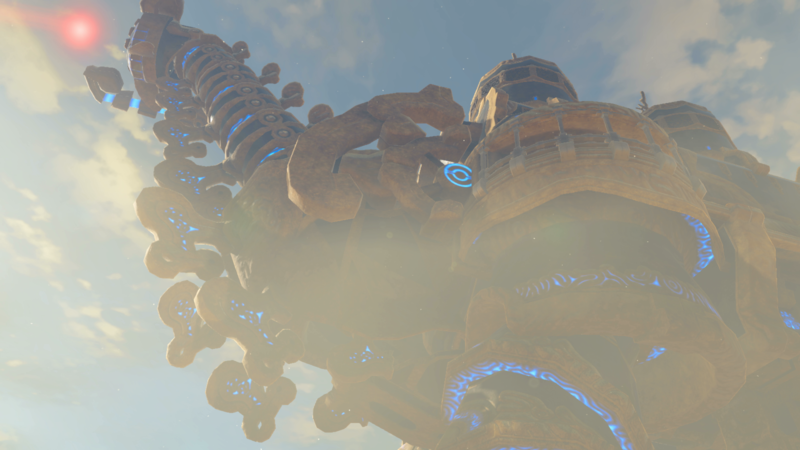 Unlike in previous fights, the player will not be able to use their own weapons and armor against it and will be given a set amount of weapons instead that they must use to beat the boss. 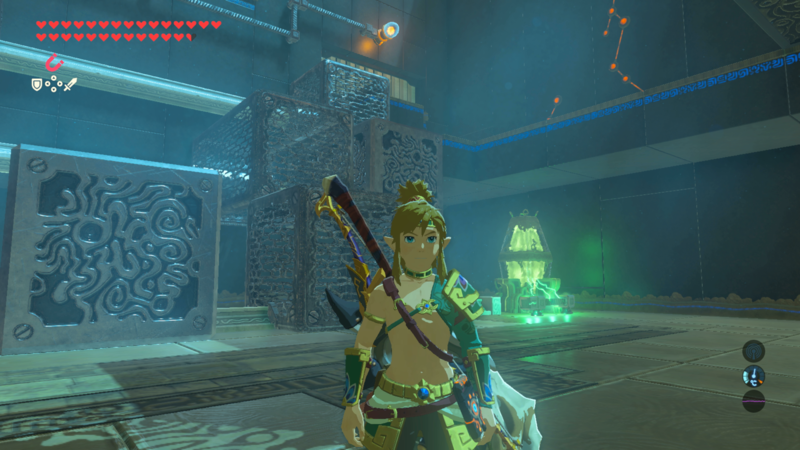 After beating the boss battle, you will gain access to a cut scene showing how Urbosa became the Gerudo Champion. 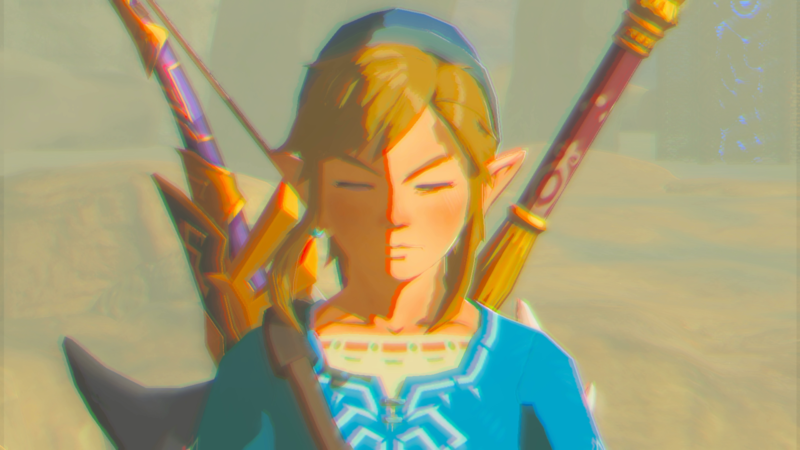 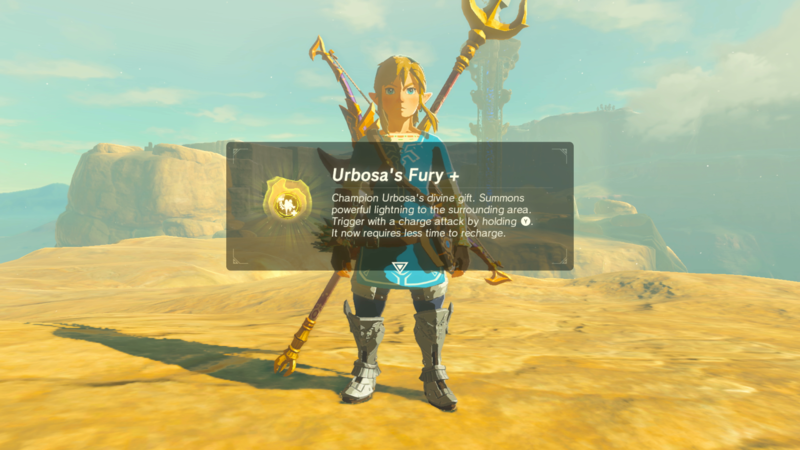 Link will also receive an upgrade to Urbosa's Fury, which automatically protects Link with a strong charged attack when the player holds down the Y button with any weapon.